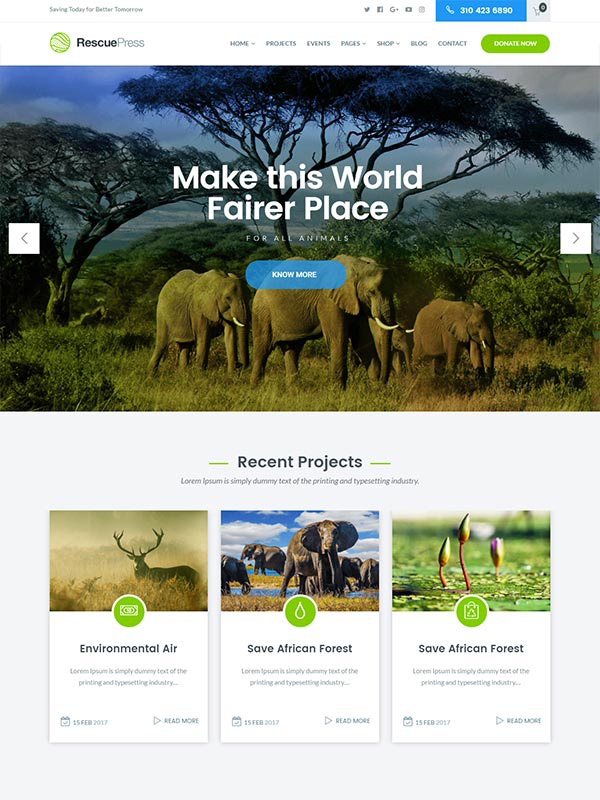 Being fully responsive in nature, RescuePress Environmental WordPress Theme is specifically designed for environmental but it can be also be utilized for several other purposes like fundraising, crowdfunding, charity websites, donation, churches or any other non-profit organizations. 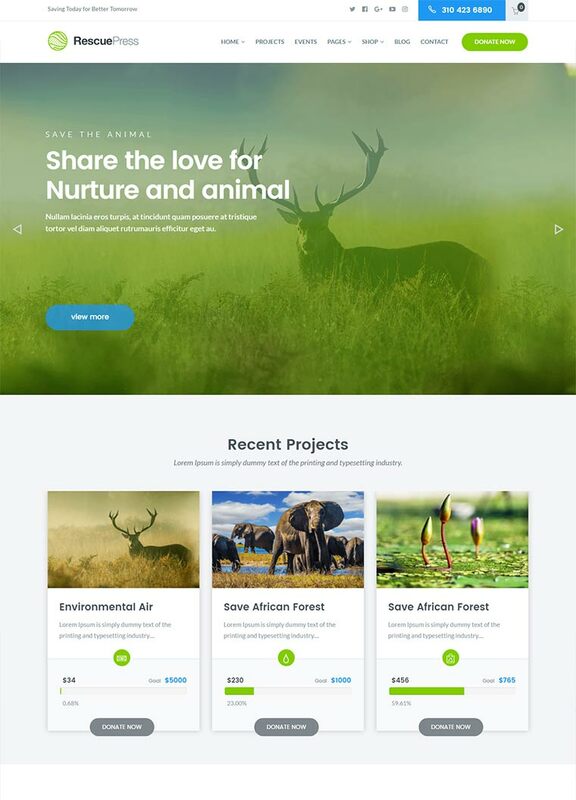 Making use of this theme, you can create an awesome website that will help you in reaching to a large number of donors as well as collecting donation to rescue the lives of animals. Coded in LESS CSS, this theme provides you the ultimate freedom to change the color theme as per your wish by just altering a variable in the CSS. This donation WordPress theme comes equipped with MegaMenu plugin using drag & drop builder. It enables you to create distinct menus at a time providing your users an ultimate navigation experience. Modify the way of accepting donations online with this donation system. This orphan theme enables you to accept charitable gifts and donations through customizable donation form. This save animal WordPress theme support multiple languages and RTL support that means that you can translate your website in any language which helps in reaching to prospective customers. This crowdfunding WordPress theme is equipped with payment method that enables you to collect funds through varied mode of payments such as PayPal, PayU, Bitcoin, Amazon, and Stripe. Featured with event manager plugin, you can easily create events, accept event bookings and manage the complete task seamlessly. Apart from this, you can also track the location of the event and many more. Loaded with drag & drop interface, this visual composer plugin enables the users to create multifarious pages in a very short duration. To assist you in the process, custom shortcodes are also included. The RescuePress Orphan WordPress Theme is designed in a way that it enables you to create 100% W3C validated & SEO friendly web pages that are capable of caching on Google and other major search engines. Tested and verified on GTmetrix, the theme exhibits A+ grade loading speed. Equipped with project/causes plugin, this RescuePress theme enables you to create any new project and collect donation for that cause. Once the target is achieved, automated notification will be sent to the admin to proceed ahead. This crowdfunding theme comes with a volunteer feature that enables you to add a volunteer page to your site where people could easily give their names for volunteer in any event of their choice without the need of contacting anyone. Compatible with Contact Form 7, this WordPress theme allows the users to interact with the business without any trouble. Moreover, this feature enables you to create contact forms and capture the user’s data with more accuracy. This environmental WordPress theme comes packed with shopping cart feature. The theme is completely compatible with WooCommerce shop along with multifarious options that are included as a part of the theme. The Rescue WordPress theme comes equipped with Google web fonts ensuring that you never feel the shortage of good fonts. It helps the users add customized visual appearance with varied font options to the website. Developed with a mobile first approach, Rescue WordPress theme is a fully responsive theme that is rendered with equal sharpness on all range of devices such as desktop, laptops, mobiles and tablets. Apart from the amazing and unique design, the customer support shown by Vikash, Atif and their crew is nothing short of incredible!¦They respond quickly and work diligently to get to root of the problem, whether it's yours or theirs and put it right! Great work guys!